When the American Hockey League began its 2012-2013 season, the NHL lockout was in full swing. The players kept their heads down, kept playing and have finally reached the pinnacle of AHL play. Saturday night at 7 p.m. ET, Game 1 of the Calder Cup Finals kicks off in style. The Syracuse Crunch have run roughshod through the postseason, losing just once, to the Wilkes Barre/Scranton Penguins in the Eastern Conference Finals. The Crunch, an affiliate of the Tampa Bay Lightning, have reached the Calder Cup Final for the first time in franchise history. They are led by Ondrej Palat, who leads the all players in the postseason with 20 points (5g, 15a).Tyler Johnson, the regular season AHL Most Valuable Player, has 17 points and a +13 through the first three rounds. Cedrick Desjardins, acquired from Montreal earlier in the season, has been stout in net. He has three shutouts in the postseason. 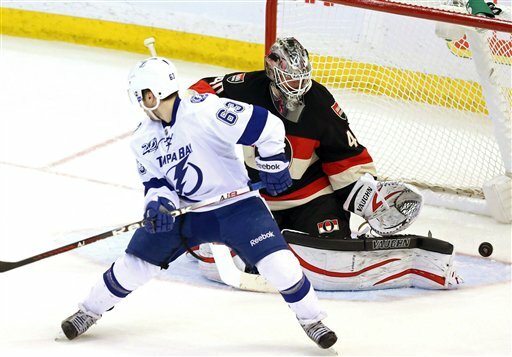 Tyler Johnson #63 deflects in a goal earlier this year for the Tampa Bay Lightning. Back with the Syracuse Crunch, Johnson has led his team to the Calder Cup Final. Game 1 is tonight at 7 p.m. They will go into battle against the Grand Rapids Griffins in Game 1 on Saturday night. The Griffins, an affiliate of the Detroit Red Wings, are led by Tomas Tatar (16p), Luke Glendening (13p) and Tomas Jurco (13p). Also, AHL fans can watch the game online for free thanks to AHL Live Fan Appreciation. Just go to AHL Live and enter the promo code: ‘CALDER2013’. Enjoy the Finals (you know, since the Stanley Cup ones aren’t here yet)!